Do you play Mahjong game online or download Mahjong games and play Mahjong to have high scores? Do you have a mahjong strategy for scoring and winning in the game? If you don't have strategies then read this review where I want to share with you Windows 7 Mahjong Titans tips and tricks. So you can build and develop your Mahjong strategy for Windows 7 Mahjong Titans game. Mahjong Titans is a new game introduced by Microsoft to Windows users with Windows Vista. Since many Windows users choosed to continue with Windows XP, many Windows users have found the chance to play Mahjong Titans in Windows 7. In this Mahjong Titans game review, I want to share Mahjong Titans strategy to win and get higher scores in Mahjong Titans game. If you want to learn more information on Windows Mahjong Titans game please also read the game review at How to Play Mahjong Titans Game on Windows 7. If you are Windows 8 user and looking for a Mahjong game for Windows 8, you can install Mahjong Deluxe app, one of the best Mahjong games for Windows. Many players ask if there is a difficulty level among Mahjong Titans layouts. There is no evidence that the mahjong layouts are designed to create difficulty levels by Microsoft or the game developer company Oberon Games. Layouts are for users who want to play in different scenarios. A different layout will be more enjoyable than playing Mahjong always in the same layout. But in my opinion it is obvious that Mahjong layout designs which are compact, narrow and high levels of tiles are more difficult than Mahjong layouts that are wide and less tiles on top of each other. In the below picture, Windows players will find the 6 Mahjong Titans layouts defined within the Windows 7 game. 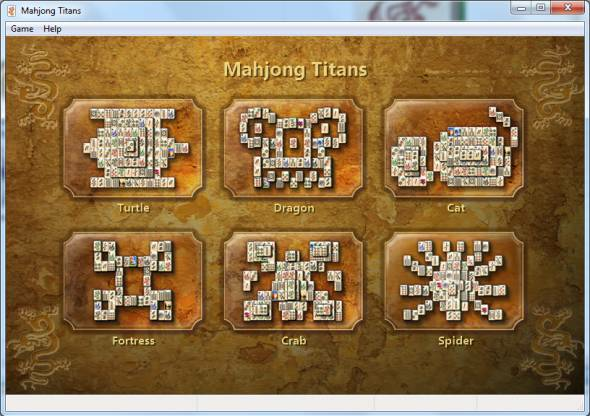 These six Mahjong Titans layouts are Turtle, Fortress, Dragon, Crab, Cat, and Spider layouts. I found the Mahjong Titans Fortress layout a little bit difficult when compared with other layouts, because the free tiles are less in this game. For example the Turtle layout has more free tiles that can be matched with each other. You may want to play with different Mahjong solitaire strategy on each Mahjong Titans layout. And the strategy may differ if you want to win with high score or if you only target to win whatever your score is. If you aim high scores then concentrate on actions on the Mahjong game board which has more points and which will bring bonus points to you. Pairing Mahjongg tiles with in the same class or same tile category in following matches will bring more points after every pair selection. When you remove tiles from the same category one pair after another pair you will get the bonus points. Also matching special tiles among other free Mahjong tiles has more points then ordinary tiles. Although the effect of time is trivial, I believe time must be considered as an other parameter in high scoring in Windows 7 Mahjong Titans game. If you are fast at solving the layout, your score should be higher than the slower gamers. But time does not seem to be effecting the Mahjong Titans scoring. You can use the Hint feature by pressing the H key or using the Game > Hint menu options for finding fast matches. In this case the game will suggest you a new pair everytime you press the H key, but don't forget that the suggested move may not be the best selection among available other pairs. But using Hint will cause you to earn less score for each pair. Besides above topics, another important detail to keep score in Mahjong Titans is to avoid Undo in the game. But at the end if you can not finish the game, your score will be useless. So it is a better Mahjong strategy to use Undo action when it is a necessity. If your aim is to pair all of the Mahjong tiles on the Mahjong board then just concentrate on maximizing the number of free tiles with each movement. This time your Mahjong Titans strategy will be freeing as much number of tiles on the Mahjong layout, maximizing the number of free tiles. Gamers can see the number of available matches that are on the current Mahjong layout, on the bottom left of the Mahjong Titans screen during the game. Windows game players should grab the Mahjong tiles on the distribution from top to bottom and from outside to inside. If you do not bother the time, then check every Mahjong tile match on the Mahjong board. Before removing a matched tile pair from the layout, be sure that there is not any other tile that may also match with the group. If there are three same free tiles on the layout, then try to clear that the fourth one will not be locked by choosing two of the three tiles. Try not to use the Hint option in the game. Or at least use Hint just to see all available pairs on the Mahjong layout. But do not remove the suggested tile pair directly before considering the other options too. All you have to do is the old game trick! Save your winning game and play the same guarantee to win game each time and increase your Windows 7 Mahjong Titans game statistics. So before removing the last few Mahjong tiles on the layout board, save the game. Then quit the game and clear the statistical values. To clear, follow menu options "Game > Statistics". This menu navigation will display Mahjong Titans Statistics. Press once the Reset button on the displayed screen to clear all statistics for all layouts. Note that if you reset statistics, this will be done for all layouts. Then as last step, load saved game, finish the Mahjong Titans game by removing the last few pairs from the Mahjong layout. Do the same as much as you want :) Your statistics will be wonderful, but be honest to yourself. Try the hardest way to make your statistics better not perfect.